O penetrômetro digital de frutas é um lançamento da SoilControl, sendo indicada para laboratórios da engenharia de alimentos e grandes e médios fruticultores.Instrumento de alta precisão vem alojado em estojo de luxo, com vários acessórios.É oferecido como item opcional, um suporte para bancada de alumínio anodizado, o que confere a chamada padronização de procedimentos dos ensaios. Acessórios fornecidos: duas pontas padrão para ensaio em frutas de 8 e 11mm, arruela limitadora de penetração na fruta, cabo RS-232,, manual de instruções em português, e estojo de transporte para o penetrômetro de frutas. Itens Opcionais: software para interação com o PC e o suporte para a fixação em bancada, é acessório opcional!...não incluso! Procure nesta lojavirtual por Bancada para Penetrômetros Analógico ou Digital Ainda, são acessórios opcionais o dispensador de pilhas/baterias, e a ponteira padrão de 6mm c/ haste de prolongamento. Esses itens poderão ser adquiridos posteriormente via soliciação de orçamento. The PDF-200 penetrometer is highly useful in testing the maturity of many types of fruit. 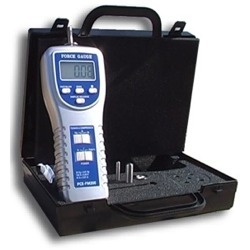 This digital penetrometer offers a higher accuracy and resolution than any other analogue device. With the PDF- 200 penetrometer you will obtain valuable information, no only about the optimum time for picking fruit, but about the progress of the fruit from when it is picked until it is consumed, including when it is being stored and shipped. The PDF-200 penetrometer is controlled by a microprocessor, is easy to read an accurate and can be fixed to an optional test position. It is powered by batteries or by a mains adaptor (300mA power source available seperately). The display of the penetrometer can be turned 180° to allow for better visibility when taking measurements. To transfer data from the penetrometer to a computer, you need the optional software pack with data cable. Data transfers to a computer, using the software, at a rate of one reading every 2 seconds. The test position is ideal for measuring in quality control and in laboratory experiments. 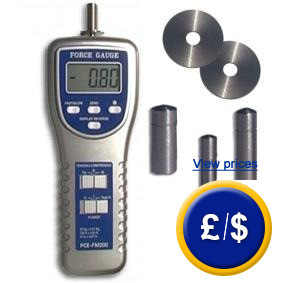 This link shows an overview of penetrometers more suitable to your needs. The importance of measuring the firmness of fruit for testing maturity. To talk about the maturity of fruit, its important to distinguish between physical maturity and commercial maturity. Physiological maturity can only transpire while the fruit is still on the plant and is the last moment when the fruit can be picked to be sold. Commercial maturity occurs later, and indicates the best time to consume the fruit, when its colour, flavour and texture are ideal for the consumer. In the case of the climatic fruit, the commercial maturity of the fruit can occur some time after it has been picked. While fruit is maturing, important changes occur inside, such as changes in colour, form and texture. It's important to have objective values available with those that evaluate the changes in the fruit as it matures, to allow for decisions to be made as to when the fruit should be picked and processed (to determine the quality of fruit from the moment it becomes a product to its final consumption). 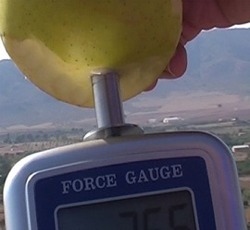 The firmness of the fruit, measured by the penetrometer, one of the most objective parameters in relation to the fruits maturity and as such is one of the most common techniques used in testing. Other methods are to determine the colour or the content of soluables using a refractometer (this technique is proportional to measuring total sugar and thus the sweetness of the fruit). If you are looking for refractometers to measure the sugar content of fruit, you can see them at this link. Generally, the firmness or hardness of fruit measured by a penetrometer decreases as the maturity process occurs. 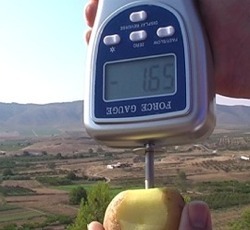 Of course, you have to take into account that the firmness of the same fruit can vary, in general terms such as fruit variety or the region where it is cultivated, or due to its size or the temperature of the fruit when it is being measured by the penetrometer (the higher the temperature, the less firm the fruit is). (Range 0 - 1kg. 6mm). diameter sensor (Range 0 - 5kg. 6mm) or the 8mm diameter sensor. (Range 0 - 5kg. 8mm). diameter sensor (Range 0 - 13kg. 8mm) or the 11.3mm diameter sensor. (Range 0 - 13kg. 11.3mm). (Range 0 - 20kg. 11.3mm). This link has more detailed information about the tables and graphs showing the equivalence between the force measured by the penetrometer and the pressure applied to the sensor (in ranges according to DIN). This digital penetrometer offers the best accuracy and resolution available compared to analogue penetrometers. On important advantage, aside from having three different penetrating sensors, it eliminates the need to purchase multiple analogue devices required to perform the same functions as this PCE-PTR 200 digital penetrometer. Data transfers to a computer, using the software, at a rate of one reading every 2 seconds. 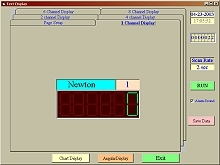 The penetrometer can trasfer data at a quicker rate when transferring from memory to a computer, one reading every 0.25 seconds using Windows hyper terminal. Choose to most appropriate sensor for the type of fruit that is going to be measured. Remove the skin of the fruit. Press the sensor until it penetrates up to the indicating mark on the sensor. View the value measured as shown on the display of the penetrometer. 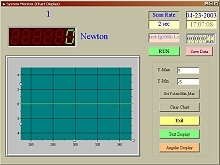 Software indicating the time interval in which the device shows and adjusts measurement values. Can indicate digitally and with graphic curves. Software with the value curves for the penetrometer: Can choose between representation in analogue or digital. Sensor with 6mm and baterry dispenser.